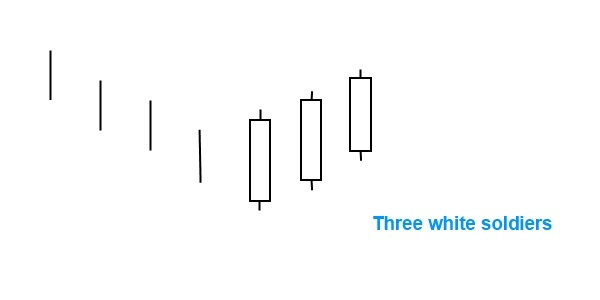 Three white soldiers is a complex candlestick pattern made of three candle lines. On all the three days market opens at the low price of the day and closes at the high price of the day. It is bullish in nature and appears after the end of a down trend. There are three long white candlesticks on three consecutive days. Each of the candles opens above the previous day’s open. Preferably, they will open in the middle price range of the previous day. Furthermore each candle opens progressively upward, establishing a new short-term high. It is important that the candles have very small (or missing) upper shadows. Although the three white soldiers is a very rare reversal pattern, it performs reliably. If you notice a very similar pattern occurring during a downtrend, but the three candles are black-bodied and moving progressively downward, you’ve encountered three black crows.